Masterclass 7 - 11 June 2017. Personal records for Stuart, three times on his first salmon expedition in Norway and the Stjørdal river. There was a definite improvement on 2016 that we all ate together, which improved camaraderie, and I wish to thank our Norwegian friends for taking everything in English. Much respect, and I hope I didn’t teach you too many new words. We had the conditions we wanted, +/- 100 cubix and <10 celcius, so the class was very apt this year. We also had fish in the river, and I needed to dig on my reserves of excuses for not adding to the catch record. Mainly, I just want others to catch first, so it’s all your fault. Well done Stuart for saving our embarrassment, and for landing a new personal best. Personally, I think that beautiful fish was 25lbs all day long. It was great that we got there to see it. It made the lost fish at the bridge, and the lost phone so much easier to bear. My eyes are still struggling with the UV. It’s a subject I have heard about before, and I do buy into it to a degree. To be continued. But the UV glue, now there is something truly miraculous. Maybe we should have tried it on the hooks, to attract the salmon, and then help keep them there. We fished hard, and were rewarded with plenty of contacts, but for some reason, the fish kept falling off. I even tried Loop hooks! 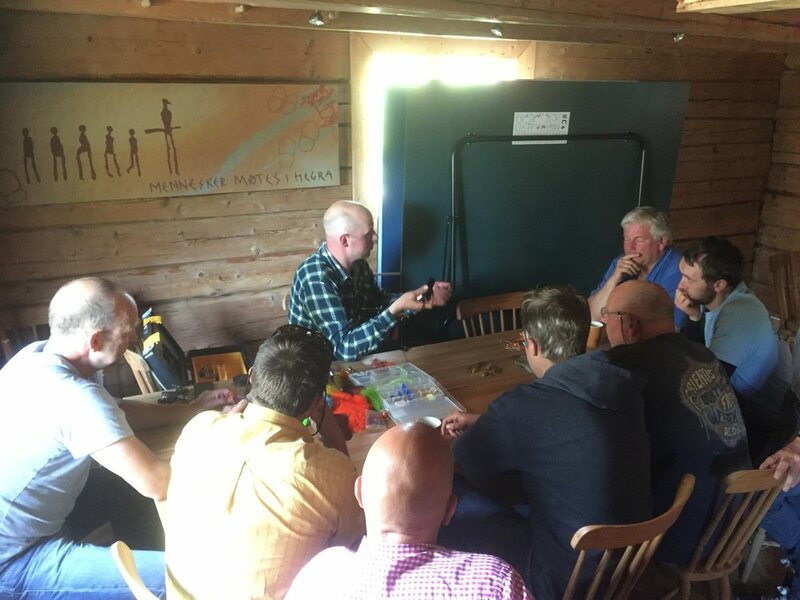 This would be an interesting Masterclass subject, but somehow I doubt it would have made much difference…it’s salmon fishing, not salmon catching. I really want to thank my fishing buddies. Espen, Ole, Jorgen, Angus, Stuart and Richard. We managed to fish in peace without an organized rotation, and good humour all round. My sprint with Hajas having just arrived on the bridge pier in the middle of the river to help Jorgen will remain in my memory with me for some time. It’s probably a good thing I didn’t know about Espens canoes, as I may have tried something really stupid to free his line from the rock. Richard has the sight of the 2 moose swimming across the pool embedded in his mind. You don’t see these things unless you are on the river. Piscator non solum piscatur. Until the next cast, it could be the one.